Its actually took me 4 months to really come up with the full itinerary before our actual travel. so to cut the story short we finally departed from Kota Kinabalu to Kuala Lumpur on this date but if you are coming from Kota Kinabalu you gotta transit in Kuala Lumput for an hour or two. Unlike our trip to Singapore, this time the flight went smoothly. We arrived at Noi Bai International Airport around 3pm as expected and head straight to Hanoi City. Noi Bai International Airport to Hanoi City only cost us 9000 dong using public suttle bus! It might took a bit (a lot actually) of your time because the bus will stop everywhere around the city, but what's a good way to see the city other than being on the hop in and hop off bus. right? As soon as you come out from the airport, make sure to ask around where you can get a shuttle bus. Its a bit hard to communicate with local people here since most of them doesn't speak english but we manage to find the bus in short amount of time (see, we learn a lot of self-made sign language during our 2 weeks trip! lol). The bus last stop at the Old Quaters and we need to exchange bus again because we wanted to go to My Dinh to buy sleeping bus ticket. After we ask around, they told us to get bus number 23. We can't really communicate with the local so we did manage to get into bus number 23 but the bus went to the other stop. We were supposed to go the other side of the road but i guess we got a bit confuse with the instruction given by the woman in the counter. Lucky we only need to pay for 8k dong. Then we follow the same bus to My Dinh bus stop where we need to pay another 8k dong. We arrived at My Dinh Station and went to buy the last sleeping bus ticket to Cao Bang as soon as possible. We manage to buy the last sleeping bus and still have like and hour and half to waste so we went to eat and clean ourselves before checking in into our bus. I decided to buy bus ticket on the spot because i look through it online and the price is usd25/person/1 way Hanoi to Cao Bang. And that was probably the best decision i ever made because it's a lot more cheaper. we manage to get the ticket for 200k Dong which is equal to RM34.98! only USD 8! We arrive at the Cao Bang city around 6AM. Yes its soooo early. And we are very lucky because one of the bus conductor can speak Malay! YASSS! See, the trick to travel by local bus is to always and always be friendly but not too much (I mean just enough). The Conductor bus said that he used to work in Johor for 4 years and that's how he can speak Malay fluently! We ask him to drop us nearby the hotel i book through Agoda and he agreed. Always make sure you turn on your data for location! This is one of the thing that i want to highlight during our trip actually because this is one of the best homestay i've stayed during our 2 weeks trip (No, this is not a paid review. I wish!). We arrive at the Homestay as early as 6 am. And as usual you can only check in at 12pm right? They have the same policy too but we are allowed to used the kitchen to rest. They even allowed us to use their bathroom and they provide towel. The homestay was very clean too, small but clean. Almost like a hotel but with shared bathroom. SO, after taking a bath and make ourselves clean and pretty (kekeke), we decided to begin our journey to Cao Bang. Gosh i am too excited i can't wait to see the waterfall! It's actually in my bucket list to go to this waterfall since i saw it in the airasia magazine like a year ago. lol. So, after breakfast near to our hotel. Our breakfast. 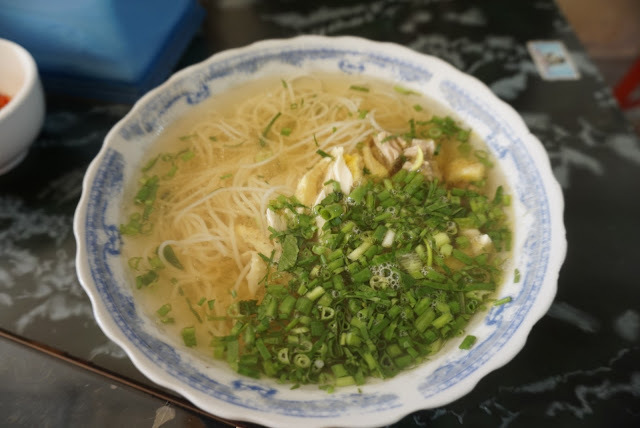 The famous Pho Soup. Its nice but it's doesn't make us crazy for it. oh ya, just infront of the hotel, there's a lot of restaurant nearby, so its very convenient. the only thing about this hotel is that, it's a little bit far from the bus station. And since we don't want to waste money on the transportation (we also want to avoid being scammed) so we...WALK. lol, Its only 15 minute walk but since its soooo hot its feels like hours. lol. When we arrive at the bus station, we tried asking the person at the counter where can we buy ticket for Ban Gioc Waterfall and she just point somewhere outside. NO ENGLISH. 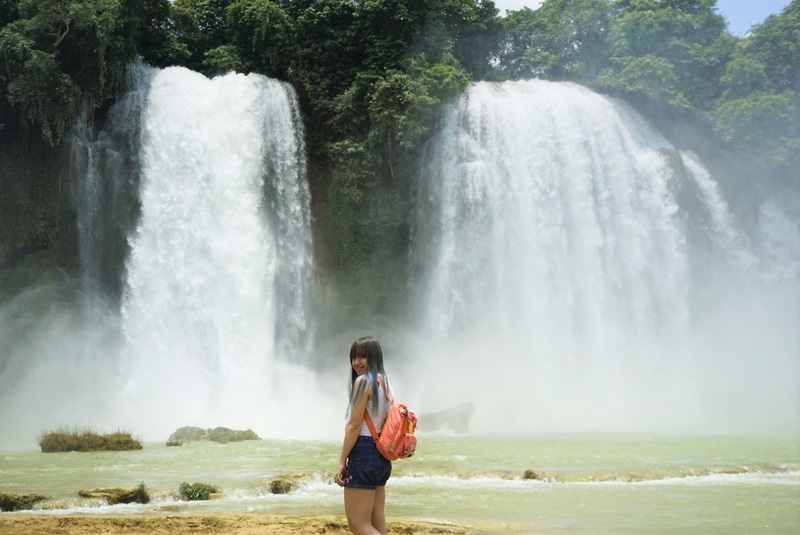 To cut the story short, while we were trying to find which bus going to Ban Gioc, one of the driver appraoch us and show us the picture of the Ban Gioc waterfall since he can't speak english. So, that's how we know which bus to go. lel. I can't believe that i am actually infront of one of the most beautiful waterfall in asia! Now that i think about it, i was taking video and photo the whole time and i regret it a bit. I should've just sit for a whike and try to enjoy the waterfall more. 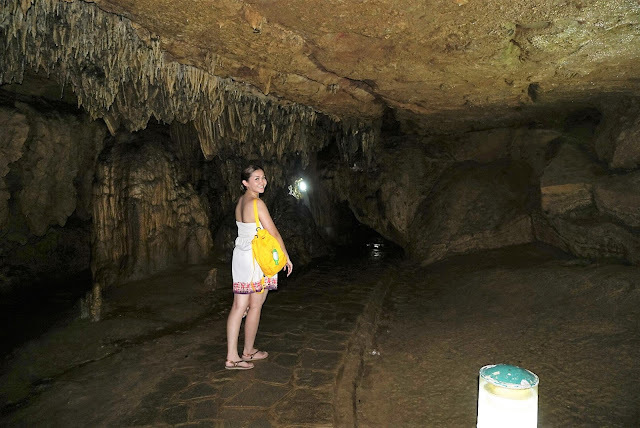 After taking as much photo as possible, we went to another tourist attraction in Ban Gioc that is the Nguom Ngau Cave. If you are a cheapskate like us you can wait for the bus which cost you only 5000 dong equal to 1 ringgit Malaysia. Or if you are in a hurry, then you can ask around because there's always a grabmotor charge 40k dong per ride to the Nguom Ngau Cave = RM8/ride. If you've decided to go with the bus, you'll have to walk for another 25 minutes to get to the cave. Personally i prefer walking since the view on the way is just so amazing! but then the sun is also quite amazing that day. We get back to the town by local bus around 5pm. After resting and cleaning ourselves, we go out to see the town. Most of the shop are closed by 8pm except for the restaurant. And most of the fancy restaurant didn't serve food only drinks. So we had to eat at the street restaurant which is good for me. Tips to find a good restaurant without a local guide? The more people in the restaurant, the better the food taste. However not all the time it works, but most of the time, YES. There's really nothing you can do in Cao Bang city at night so we went back to our hostel, bought some snack and watch movies! Lucky i bring my mini laptop! 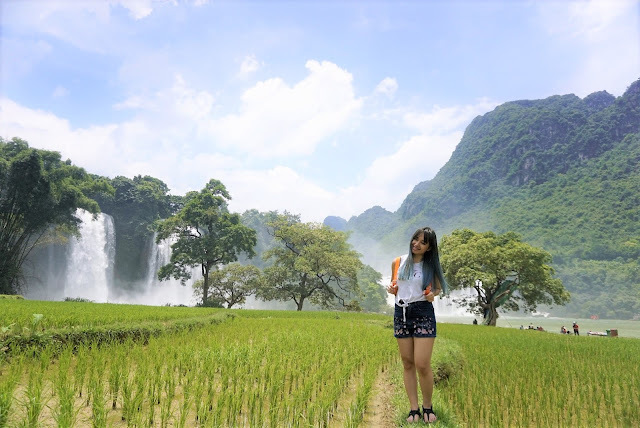 Here's my Vlog about Cao Bang. TO READ THE FULL ITINERARY CLICK HERE. I just started learning how to edit video and stuff. You can comment on how i can improve my editing skills. And show some love by subscribing my channel. Muah! Enter your email address to get update quickly! DIY: How i make my own bed! Exploring Vietnam: Hanoi to Ho Chi Minh (10 days full Budget). DIY: How to make your own ripped jeans! Here's the five things your should have before starting a diet plan!